A paper published today in Palaeogeography, Palaeoclimatology, Palaeoecology reconstructs climate change in central New Mexico, USA over the past 12,800 years and finds mean annual temperatures were ~1°C warmer than the present during the Roman Warming Period 2,000 years ago, the Medieval Warming Period 1,000 years ago, as well as during other unnamed warming periods in the past. The paper also shows cold periods were relatively wet, and warm periods relatively dry, the opposite of the claims of climate alarmists. Furthermore, the paper shows that mean annual precipitation today is neither dry nor wet in comparison to the precipitation extremes over the past 4,000 years. Middle graph indicates mean annual temperature today of 11C by vertical dotted line. Reconstructed temperatures were ~1C warmer 6000 years ago, during the Roman Warming Period 2000 years ago, and during the Medieval Warming Period 1000 years ago. Right graph shows cold periods were wet and warm periods dry, the opposite of the claims of climate alarmists. Present day mean annual precipitation is shown by the dotted vertical line. A thick sequence of fine-textured alluvium in central New Mexico has provided an opportunity to reconstruct vegetation type and climate at the western edge of the Great Plains grassland. The analysis of thirty-eight AMS radiocarbon ages, δ13C values, and modern weather data has produced a 12,800 cal yr record of changing C3–C4 vegetation, temperature, and precipitation. The record begins with the Younger Dryas that was characterized by C3 plants and was about 2.4 °C cooler with over 100 mm rainfall than today. After 11,000 cal yrs BP, the climate became less cool and less wet, reaching present-day conditions by 9000 yrs. The middle Holocene was C4, warm, and dry although the δ13C record is incomplete for this interval. From 3300 to 1400 cal yrs BP, the climate was cool and wet with C3 plants, averaging 0.5 °C cooler and 22 mm greater rainfall than today, matching other records in the region for a wetter climate. After 1400 cal yrs BP, the local climate became warm and dry, shifting to C4 vegetation. The severe second century drought, first observed in tree-rings in southern Colorado, is supported by the δ13C data and occurred during the interval A.D. 40 to A.D. 180. Hiatuses in the local alluvial and δ13C record extend from 9000 to 6000 cal yrs BP and from 1000 cal yrs BP to present. ► Carbon isotopes yield 12,800 yrs of C3–C4 plants, temperature, and precipitation. 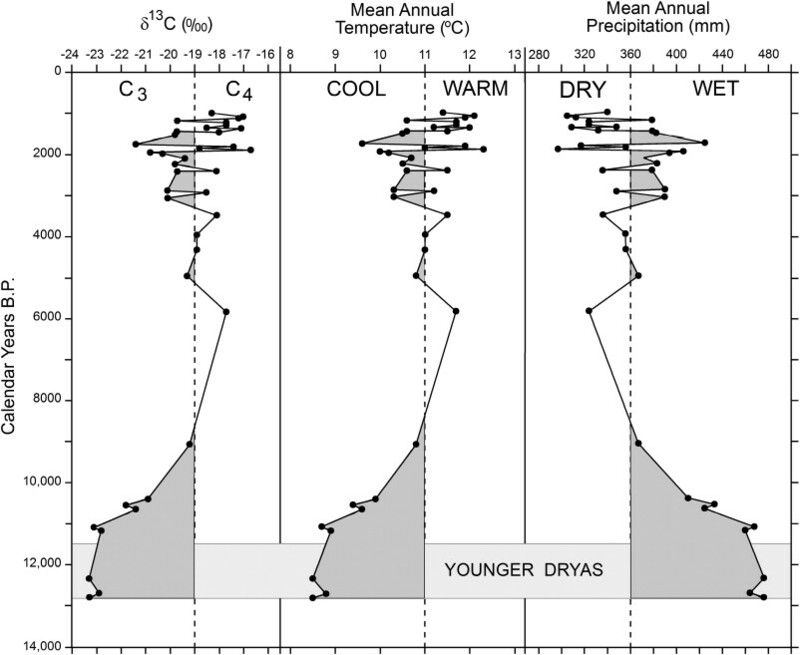 ► Younger Dryas was about 2.4 °C cooler and over 100 mm wetter than today. ► Late Holocene 3300 to 1400 calendar years BP was cooler and wetter than today. ► Severe second century drought documented between A.D. 40 and A.D. 180.